The Dovo “Bergischer Lowe” straight razor with a 5/8″ blade is a distinctive blend of artistry and efficiency. The blade is mirror polished and is spectacularly designed with a gold Spanish Point etching and gold sculpted plating on the spine. The handle is crafted from genuine natural buffalo horn and is hand-polished to perfection by a member of the legendary Dovo family of craftsmen. The natural patterns of the horn ensure a one-of-a-kind finish on each razor. 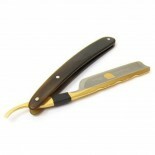 A remarkable razor fit for a gentleman.